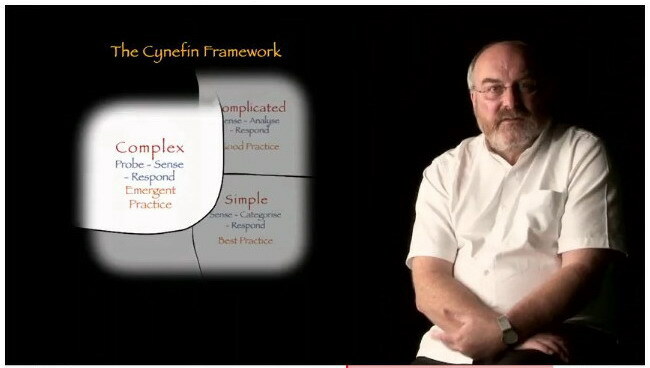 Thanks to IFAD and @rsamii we had a very interesting morning yesterday meeting Dave Snowden for a lecture on his Cynefin framework. Dave talked for more than one hour and I was overwhelmed by an incredible flow of inputs, suggestions, questions and doubts. These kind of moments are fundamental for professionals like me who have to afford the complexity Dave is describing in his approach. To be able to “probe, sense and respond” we must be always open and willing to look for and receive new inputs from outside. 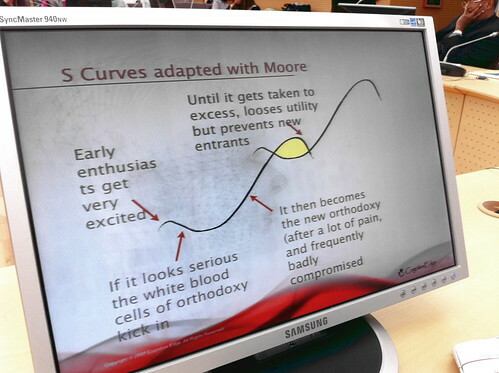 @snowded said: “We must create new architecture where applications work”. To do that our brain must be always stimulated and fight the risk of being stuck on our desks, behind our monitors, locked in our rooms. Categories: ideas, questions, reports | Tags: communication, complexity, cynefin, cynefin framework, dave snowden, development, future, IFAD, km, km4dev, knowledge management, knowledge sharing, lecture, lessons learned, needs, people, probe sense and respond, Rome, tacit knowledge, talk share, trust, UN, web | Permalink. Where can I find a good excel template to produce GANTT? 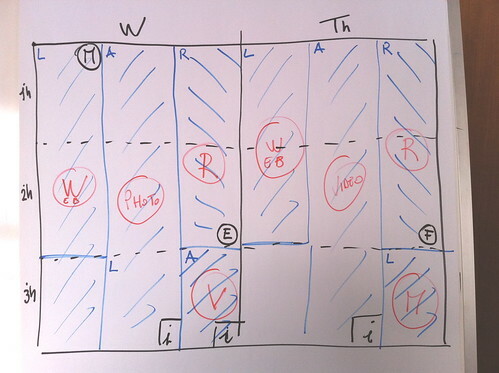 Write an answer on Quora: Where can I find a good excel template to produce GANTT? Categories: questions | Tags: action, capacity building, communication, facilitation, future, GANTT, interaction, km4dev, knowledge management, knowledge sharing, network, people, q&a, quora, talk share, technology, template, tools, training | Permalink. The blog of the KM4DEV 2010 annual meeting has just been launched. Follow the activities of the next gathering of KM4Devers in Cali, next May 2010. In order to register, please fill out the form that is available at: http://www.surveymonkey.com/s/SFQX7S3 before May 14. Categories: news | Tags: action, blog, blogging, Cali, capacity building, Colombia, espanol, facilitation, friends, future, interaction, km, km4dev, knowledge management, knowledge sharing, ks, Latin America, meeting, online communities, people, spanish, talk share, trust | Permalink. The new FSCA-PISA collaboration platform is online! It has been launched during an interesting online ceremony which gathered almost 40 people in front of the screen. For this occasion, all the seven West African countries which are taking part to the programme were involved in the event. FSCA – Food Security through Commercialization of Agriculture is the Italian Special Contribution to the Global Trust Fund for Food Security and Food Safety established by FAO. The Programme adopts a relevant communication component to support its activities. As you can see in the image below, each national office (National Project Directors and Coordinators, their Assistants, the National Consultants, the Inter Country Coordinator and his Team, and all the experts from the FAO headquarters) gathered in front of the webcam for a multilateral audio conference through Skype in occasion of the launch. show how online interaction is possible among us. 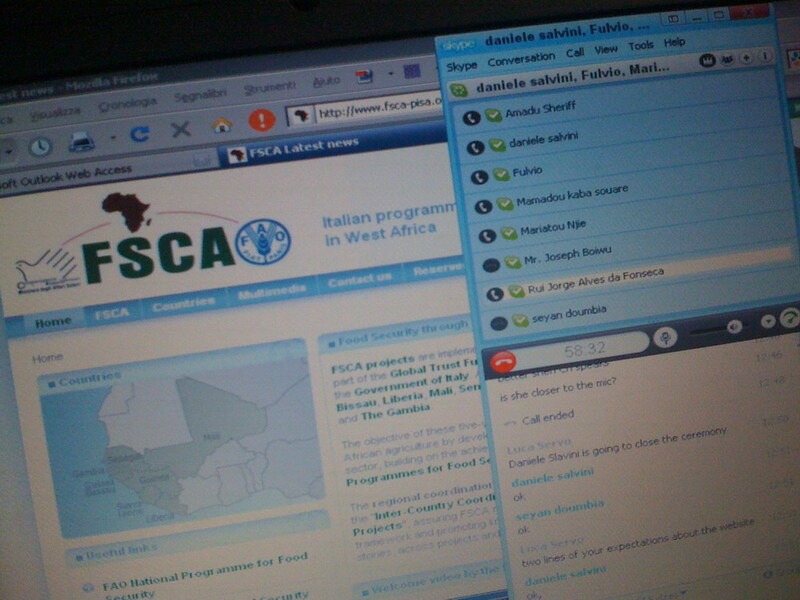 Spending an hour in front of the video with six connections almost always on, having rounds of intros, comments and exchanges, gathering almost 40 people around West Africa was in my opinion a great success for the FSCA-PISA communication strategy. We want the platform to become the “place” where our team can freely collaborate to reach better results. Now we come to the most difficult part of this effort: spreading this culture of interaction, collaboration and exchange among actors and beneficiaries of the programme. More details as soon as activities will move ahead. Categories: events, news, reports | Tags: Africa, collaboration, FSCA, interaction, Internet, km, km4dev, knowledge sharing, networking, online platform, people, West Africa | Permalink. Almost ready to the start of the second FSCA Regional Workshop here in Monrovia, Liberia. During the third day I will spend the morning introducing Communication for Development and Knowledge Sharing to the tens of people working in the seven countries (Senegal, The Gambia, Mali, Sierra Leone, Liberia, Guinea, Guinea Bissau) involved in the projects and the Inter-Country Coordination project. Categories: km4dev, reports | Tags: Africa, communication for development, development, FAO, Italian cooperation, km, km4dev, Liberia, projects, rural development, workshop | Permalink. Km4Dev has a new house on the Web! Thanks Lucie and Michael for setting it up! Categories: km4dev, news | Tags: friends, Internet, km, km4dev, knowledge management, ks, ning, people, platform, website | Permalink. Yesterday the Rome group of KM4Dev met for the second time since January ’09, when the idea was launched during the ShareFair 09. The main topic debated was: CMS implementation and related training needs. The discussions grew over the present need to give a house on the Web to many different teams inside the organizations we are working for. FAO and IDLO are actually using TYPO3 to produce new websites and online environments but this created some problems both for the final users and the facilitators/trainers/knowledge managers because of the lack of specific skills and appropriate technical knowledge that this tool specific system needs. As a consequence, awareness has raised in the group that appropriate training, both for users and for facilitators, is absolutely needed. In our case, the intermediaries between technical departments and final users (officers of different departments and their team), it is important to pass the ownership of the sites to the final users and create real capacities. Lately, the perception arose about high costs and difficulties (at least in Rome) that specific training on TYPO3 have. This observation led the group to conclude that, while evaluating a tool, the analysis of the final users’ needs and abilities is fundamental (if not the main parameter to consider for the final choice). Categories: events, km4dev, news | Tags: CMS, FAO, IDLO, International Development Law Organization, km4dev, knowledge management, knowledge sharing, meeting, Rome, Typo3 | Permalink. How to describe a crisis on the web?